You love your new drone. Yes? But, do you know that you can be penalized for using it as well? To fly a drone which crosses certain weight limits, you will need a pilot's license which cost about Rs 25,000! This is part of a requirement launched by the government under the National Drone Policy. Within 5 km radius of airports in Mumbai, Delhi, Chennai, Kolkata, Bengaluru and Hyderabad. Within 3 km from defence, civil and private airport (other than the list mentioned above). You must not fly it within any permanent or temporary Prohibited, Restricted and Danger Areas including TRA, and TSA, as notified in AIP. Within 25 km from International Border, which includes the Line of Control (LoC), Line of Actual Control (LAC) and the Actual Ground Position Line (AGPL). Beyond 500 metres (coastal) into sea from a coastline. Within 3 km from any military installations and facilities. Within 5 km radius of Vijay Chowk in New Delhi. Within 2 km radius of strategic locations, as specified by Ministry of Home Affairs. Within 3 km radius of State Secretariat Complex in state capitals. Drones aren't allowed to be operated from mobile platforms like vehicle, ship or aircraft. No drones should be operated over eco-sensitive zones around National Parks and Wildlife Sanctuaries notified by Ministry of Environment, Forests and Climate Change without prior permission. The National Drone Policy comes into effect from December 2018. Operators must have a license to fly a drone. Training will cost Rs 25,000. A UIN or Unique Identification number is required for your drone and it will cost you Rs 1000. You must clear tests related with the rules and regulations of flying a Remotely Piloted Aircraft System (RPAS). You must be at least class 10th pass and 18+ years of age. To make obtaining of license easier, it will be automated and completely digital. 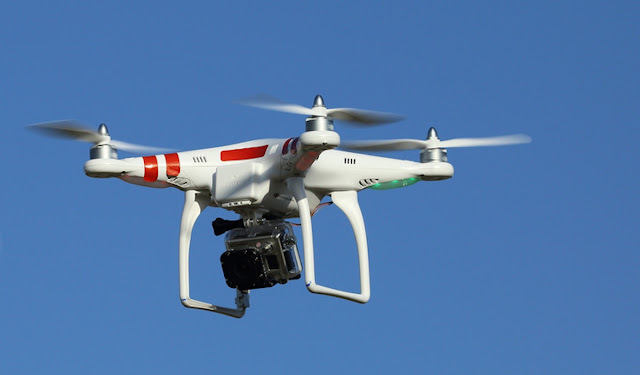 During day, drones can be flown till 400 ft and it should be visible to the operator. Drones are divided into 5 categories - based on the weight. If your drone weighs between 250 grams to 2 kilogram you don't have to get a license or permission to fly. For more details, Refer DGCA website.